Challenges - Fall into Reading. 100 books. 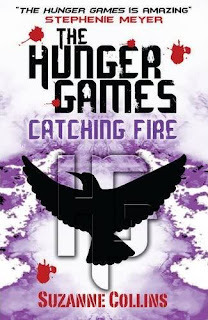 Catching Fire is the second book in the Hunger Games trilogy. It follows the story of Katniss and Peeta after they win the Hunger Games. Both books are written in present tense, which keeps you on your toes the whole way through., however it doesn't affect your enjoyment of it, as you completely lose yourself in the prose. This book is not as fast paced as the first one, but I felt that this was a good thing. I could take my time to find out what had happened to the characters and their families since the end of the games. If you haven't read The Hunger Games, then I wouldn't read any further as I don't want to spoil it for you. You will find my review of The Hunger Games here. I enjoyed this book a lot, not as much as the first one, but I still really enjoyed it. I have sat and pondered why I felt it wasn't to the same standard as the first and I came to the following conclusion. Spoiler Alert!!! I didn't like the fact that both contestants had to return to the The Hunger Games. I felt that the story could have gone a different way, rather than repeating a situation already used within the first book. I felt it had been done already, even though the circumstances surrounding their return were different. I do hope that the final book doesn't follow a similar pattern as I will be really disappointed. Apart from that niggling point, it was good. I think the best part of this book was the relationship triangle between Katniss, Peeta and Gale. In public, Katniss is being made to show affection for Peeta, who is completely in love with her, yet in private her feelings are only for Gale. The love story is such a big part of the story and a lot of the actions with the book are propelled by this. Secretly I am hoping that Katniss ends up with Peeta, as he just gets Katniss completely. I suppose where he has experienced such awful events with Katniss, he will always know how she feels. I still think Katniss is a fabulous character. She is such a strong female role model, who will go to great lengths to protect her family and friends. She appears to be much stronger than Peeta, but you can't help but love him too. Peeta will do anything for Katniss, even die for her. I have to say the plot twist at the end was completely unexpected. I finished reading the book stunned by its ending. I really didn't have a clue. Definitely worth reading, but do start with The Hunger Games as I don't feel this is a book that could be stand alone. You're definately right. When I was reading Catching Fire I was swept away by this sense of deja vu. They went BACK to The Hunger Games. I didn't see that coming, but I did feel like we'd been there before. The ending surprised me though. The ending sort of saved this book for me. I had the same thoughts about repetition. I honestly hope this ends with Katniss deciding not to go with either guy. I hope she stays strong enough to stick with her ideas about being solitary, at least until she grows up more and finds someone she can completely devote herself to. Sounds interesting - I'll have to pick up Hunger Games first. I skipped the second half of your post because I haven't read this one yet...but you certainly managed to put this one back on my radar. I bought it when it first came out, but still haven't read it...what the heck is wrong with me?!! Perhaps this one will suit me better as I found the first a little too fast in pace for my liking. Thanks for the spoiler alert by the way. I'm waiting for a little of the hype to die down before I read this series, but my husband loved it. As soon as he finished this book he wanted the next one and was disappointed when I told him it's not out yet. Clover - I thought it was just me who seems freaked out by the feeling of deja vu. Not many reviews mentioned it. Amanda - the ending was a bit of a surprise to me. I think she will definitely end up with one of them, but something will need to happen to the other one for her to be able to choose. Carmen - you will love them. Debi - you are probably like me and buy books and then get distracted by others. I very rarely read one that I have just bought. Petty Witter - this one is definitely a lot slower. Bermudaonion - your hubby sounds like me. I was desperate for the next one. At first I was thinking the same think (this is formulaic), but then I enjoyed it so much, and the situation was different in that they were so unsure of alliances, that I really enjoyed it. I liked the surprise ending too, and can't wait until the next book comes out. I'm glad you enjoyed this one! Like you, I liked the first one better but the second one is great as well. I definitely was SHOCKED when they went back into the Hunger Games I was not expecting that WHAT SO EVER, and I was a little disappointed by that, it was a little to much like the first one, but don't get me wrong I still thought that it was an AMAZING book.